On Monday and Tuesday, St. Louis on the Air aired conversations that took place during a free public forum this past week (the evening of Oct. 24). The event offered attendees insight into four of the big decisions Missouri voters face this fall, featuring in-depth discussions with proponents and opponents of several key issues on the November 2018 ballot. Host Don Marsh moderated the conversations, and audience members had an opportunity at the event to submit questions for potential inclusion in the dialogue. Listeners heard all about Amendment 1 and Proposition D on Monday's show and about Proposition B and the state's three competing marijuana proposals on Tuesday's show. Links to argument summaries and the recorded audio segments are also available below. Proponent Benjamin Singer and opponent Jim Talent offer their arguments related to Amendment 1. Proponent Scott Charton and opponent Gwen Moore give their opposing perspectives on Proposition D.
Proponent Richard von Glahn and opponent Ray McCarty weigh in on Proposition B. Proponent of Amendment 2 Jack Cardetti, proponent of Amendment 3 Brad Bradshaw, proponent of Proposition C Mike Colona and opponent of the three measures Brandon Costerison hash out the three competing proposals. READ: Pro & Con: Will Missouri voters pass an initiative to legalize medical marijuana? Among the measures Missouri voters will decide on Nov. 6 is Amendment 1: The Lobbying, Campaign Finance, and Redistricting Initiative. It would amend the state constitution to change several aspects of Missouri’s political system. It would impact, according to the ballot language, the process and criteria for redrawing state legislative districts; the campaign contributions that candidates for state legislature can accept; the gifts state legislators and their employees can accept; at what point state legislators and their employees can serve as paid lobbyists; political fundraising by politicians on state property; and transparency of legislative records and proceedings. Monday’s St. Louis on the Air brought arguments on both sides of the ballot issue into focus, featuring host Don Marsh’s conversation with proponent Benjamin Singer and opponent Jim Talent during St. Louis Public Radio’s Oct. 24 ballot issues forum. On Nov. 6, Missourians will decide the future of the statewide minimum wage when they cast their ballots on Proposition B: The $12 Minimum Wage Initiative. The measure would increase the minimum wage incrementally, with the end goal of a universal $12 minimum wage. Tuesday’s St. Louis on the Air featured a conversation about Prop B that originally took place at St. Louis Public Radio’s Oct. 24 ballot issues forum. Host Don Marsh moderated the debate between proponent Richard von Glahn of Missouri Jobs with Justice and opponent Ray McCarty of Associated Industries of Missouri. Next week, Missouri voters will get to decide on a 10 cents per gallon gas tax increase, the first in the state since voters last approved an increase in 1996. If passed, Proposition D: The Gas Tax Increase, Olympic Prize Tax Exemption, and Traffic Reduction Fund Measure is expected to generate $288 million in revenue annually – with most of it going to state law enforcement and the rest to road construction and maintenance. 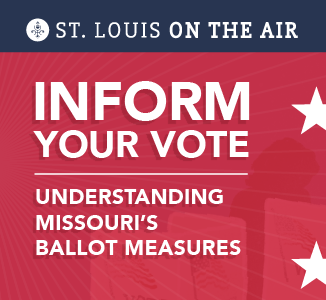 As part of the 2018 St. Louis Public Radio "Inform Your Vote" ballot issues forum, Scott Charton, SaferMO.com communications director, and Gwen Moore, a retired University of Missouri-St. Louis professor, debated the pros and cons of Prop D.